Today’s recipe is not something I would normally make but we are going to Great Britain at the end of next month and I am determined to clear the freezer of all meat. In the freezer were two ham hocks that I bought last winter, obviously intending to make pea and ham soup – my favourite soup – but, clearly, I didn’t get around to it. I knew the ham hocks were going to be a challenge to get rid of as they are something we only use here in winter. I went to Eat Your Books and searched “ham hocks” and got a multitude of recipes but, as expected, nothing other than this one sounded enticing for a hot summer’s day. 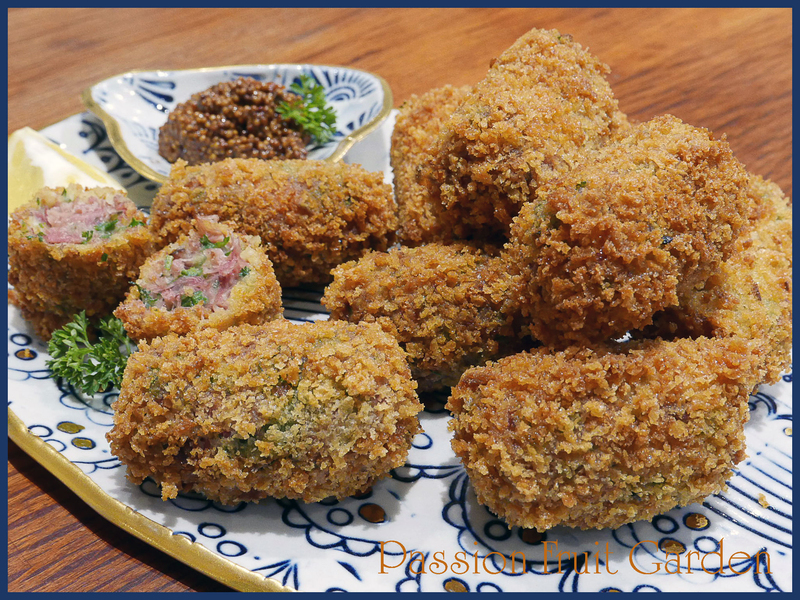 This was different – croquettes are fabulous with salad for dinner or wonderful finger food when you have guests. I decided to give them a go. Like I said, they are different from what I would normally make but different, as in this case, is sometimes good. Now these little babies taste strongly of ham so if you don’t like bacon or ham, you are not going to like these but if you are a fan of these flavours, read on. It looks like the recipe takes a bit of time, and it does, plenty, but it was not hands on time so don’t be put off. You just need to think ahead because the ham hocks are boiled for 3 hours and then left to cool. (Clearly, if you are using left over Chistmas ham, there is no need for this step.) I started in the morning but you could easily cook the hocks the day before you make the croquettes. This recipe has the added bonus of making bacon stock. Again, it is not something I would normally make but I decided to keep it. I can use it as a base for soup or even for a risotto. As nothing is allowed to be added to our freezer, I canned the stock but you can freeze it. I had 1.5 litres left over after using what I needed for this recipe. As I said, I am in the process of clearing out the fridges and pantry so instead of buying something new and having left over, I decided to make my own. The method suggested in a couple of recipes was to take some white bread, grate it on a food processor and then dry the crumbs in the oven (I would probably use 120°C). You don’t want to brown them. But because I live in a hot dry climate, I just put them on a tray in the sun and they dried nicely all by themselves. If you don’t have a food processor, dry the bread first and then grate with a hand grater. These reheat well (I know, they made enough for three meals for us) so if you are making them for a gathering you can make them well in advance and just reheat them on the day. To reheat, place on a baking tray in a 200°C oven for 8 minutes. Place the hocks in a large saucepan and cover with water. Bring to the boil then maintain for 5 minutes. Remove from the heat and drain well. Return the hocks to the saucepan. Add the onion, carrot, celery, parsley stalks (reserve the leaves for later), bay leaves, thyme and cloves. Add enough water to cover the hocks and then bring to a simmer. Simmer gently for 3 hours until the meat is very tender. Remove from the heat and cool in the stock. Take the hocks out of the stock and set the stock aside. Remove and discard the skin, fat, sinew and bones from the hocks. Finely shred the resultant meat. Strain the stock and measure out 300mils. Don’t throw the balance of the stock out. If you don’t have a canner, put it in 500 mil containers and freeze it. Melt the butter in a saucepan over low heat then stir in the flour and cook, stirring, for a few minutes – don’t let it brown. Take the saucepan off the heat and slowly add in the 300mils cold stock. Do this a little at a time. If you hurry, you will get lumps and it will take time to get rid of them. Once all the stock is incorporated, cook over moderate heat, stirring all the while, for a few minutes. Remove from the heat and allow to cool slightly then stir in the 2 egg yolks, mixing well to combine. Place the sauce, ham hock meat, chopped parsley leaves and green peppercorns into a large bowl. Mix well then taste and season with salt and freshly ground black pepper (I didn’t need to add anything). Refrigerate until chilled. Using wet hands, roll the filling mixture into logs about 3cm thick and 6cm long. Roll the croquettes in the fine breadcrumbs, then in the egg and, finally, in the panko crumbs. Heat the oil in a deep-fryer or in a large saucepan to 180°C or until shimmering. Deep-fry the croquettes until golden brown. Drain on kitchen paper. Serve immediately with mustard and/or lemon wedges. This entry was posted in Patties and Fritters, Pork and tagged Ham croquettes, left over Christmas ham croquettes, Uses for left over Christmas ham, What to do with left over Christmas ham by Glenda. Bookmark the permalink. We never seem to have leftover ham… other than the bone which I stash in the freezer for pea & ham soup later in the year, but I do have in the freezer a 5 kg ham that my aunt gave me she won in raffle after we had both bought Christmas hams. The croquettes look delicious. You are going travelling! Sounds womderful. Wow a spare 5 kilo ham sounds fab. You are very lucky indeed. Panko has been around for ages and I have been using it when I am frying chicken ( egg, sweet potato flour, Panko mixed with parmesan) , bring shrimp or small squid etc. They sound yummy. I sometimes make Ham Hock & Vegetable soup in Winter. I am sure your going to have a wonderful time in the England. We will with all our winnings, Deb. Hi Sherry, like I said to Cristina, I must be the only one who hadn’t heard of them. Thanks Carol. I hope GB sorts out all it’s Brexit woes. So do I, Glenda ..I just despair at the politicians who are so hell bent on fighting and scoring points amongst themselves instead of doing what is best for the country. Oh boy I like this idea. I think I will cook them in the slow cooker not that much heat in the kitchen. Susan, I never thought of the slow cooker, I don’t use mine much.